October is Adopt-A- Shelter-Dog Month so what can an adopted dog bring to your life? There are as many responses to that question as there are dogs available for adoption in our country! That’s why during the Adopt-A-Shelter-Dog Month celebration in October, Lexi and I are encouraging people to adopt a shelter dog and experience the joy of finding their own answers. A shelter dog can be many things to many people. Here are just a few examples of what a shelter animal can do for you, your family and friends. Shelter dogs make a great companion for lonely seniors. Shelter dogs can be a best friend and confidant for you or your child. Shelter dogs can be great running buddies if you like to get outside and exercise. Shelter dogs can be a great way to unwind after work by taking your dog for a walk. Shelter dogs can be trained to learn animal-assisted therapy or listen to children read in Library reading programs. Shelter dogs can make great partners in agility competitions. Shelter dogs can be a warm fuzzy face to greet you first thing in the morning. An adopted shelter dog can be all these things to all people. Your local shelter is the perfect place to find dogs of every type, size, age and personality. Some shelter dogs have special needs and may not get adopted as easy as other dogs but they are all waiting for a loving home. 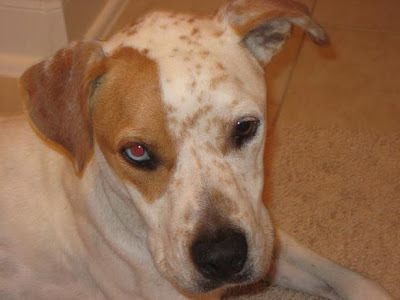 Since Lexi, Tallulah, Bailey, Nitro and I work on finding special needs dogs loving furever homes, we encourage all of you to check out our sister blog at www.deafdogsrock.com for a list of deaf dogs available for adoption throughout our great country. 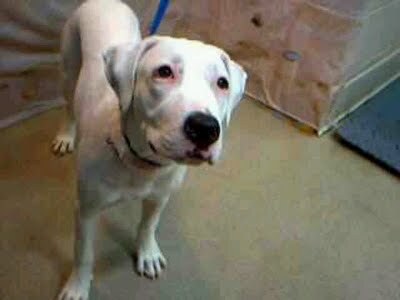 Here are just a few shelter dogs on our sister blog www.deafdogsrock.com/adoptable-deaf-dogs that are available for adoption. Deaf dogs are the first to be put down because of ignorance so please consider your next dog being a special needs dog. This is Dozer aka Bubba - He is a deaf German Short Hair Mix. He loves children, dogs, cats and especially the water. He needs a loving and patient home with a secure fenced yard. To view Bubba's profile click here. This is Charlie. 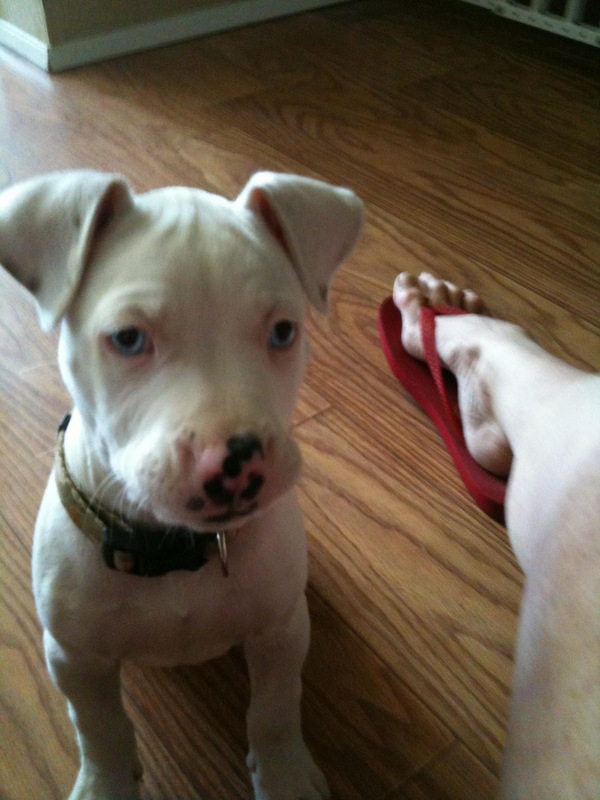 He is deaf and he is only 8 months old. He likes walks in the park, he is good with children and he is learning sign language. View Charlie's profile here. 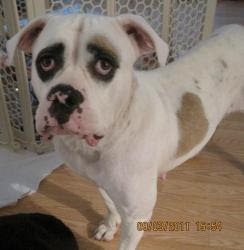 This beautiful little 30 pound female American Bulldog has not been named yet. She needs someone to love and train her. She is deaf and she is located at the Orange Co. Animal Control in Orlando Fla. To view this sweet girls profile click here. Look at this sweet girl. She is a deaf 10 week old pittie mix who needs a forever home. She is located in Yakima, Washington. You can view her profile by clicking here. 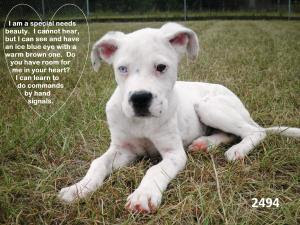 This is an adorable 10-12 week old deaf American Bulldog puppy who is located in Warner Robins GA. She will need a family with patience, love, and a secure fenced yard. View her profile by clicking here. This is beautiful M.J. She is a 13 month old deaf spayed German Shepherd mix. She is at the Animal Control of LA County in East Lancaster CA. 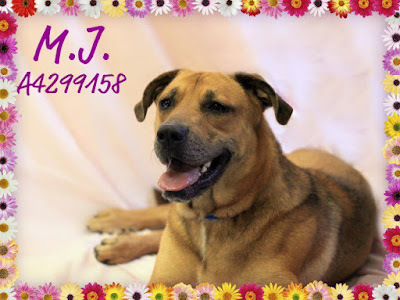 To view M.J's profile be sure to click here. Meet beautiful Chamois. She is a darling, playful sheltie mix puppy. She is mostly deaf with limited site so we need a special family that will show her love, patience and have a home with a secure fenced yard. To view Chamois' profile click here. If you wonder why we call our new sister blog Deaf Dogs Rock, here are just a few of the reasons we came up with why our deaf dogs rock. you can crank your stereo as loud as you want. you can eat snacks and chips behind them without them knowing. they have no idea they are deaf. they are not scared of thunder! they couldn’t care less about fire or rescue truck sirens. they sleep like a rock. they don’t care if other dogs are barking. in obedience class they are not distracted by other dogs or noises. they don’t mind when someone sings off-key. they have no fears over the fireworks on the Fourth of July. If there was room at the inn, I would take one of those deaf puppies in a heart beat. They are adorable. Sending them positive thoughts that they find their forever homes. What a great way to bring attention to some really special dogs. I think MJ was amazing. 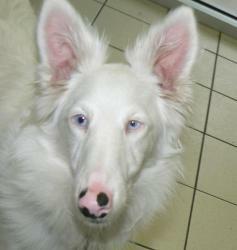 I have never seen a White Shepherd that beautiful! 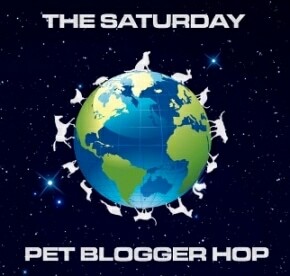 I'm featuring my foster dog on my blog today for Less Adoptable Pet Week. Maybe we'll do another for October! Thanks for all you do for deaf dogs. They need an advocate like you! What adorable dogs! Thanks so much for helping them find forever homes. Amazing work - Thank you for ALL that you do for our fur friends! One thing is for sure though, these visits to the vet's clinics bring in tons of cash for veterinarians every year.